On Satrday mornin we all went hiking. It was me, Rebecca, Emily, and another guy named brian who wasn't me. Marc was gonna come but he was hung over and when you hike when your hung over you throw up and it is not good so he did not come. We got in the car and I sat in the back. We drove very very very far. There is nowere to hike near our houses becus of urban sprall. We drove so far that we were in the fields by the mountins becuse we wanted to hike up a mountin. But valleys are good to. It costed us each $8 dollar to get in the park and one park ranger was sad becus she only had a sandwitch for lunch but the other park ranger had a chicken pot pie and he did not want to share it. After goin in the smelly portapotty we put on backpacks and started hikin. We saw lots of nature. We saw trees and birds and horse poop all over the road goin in but no one was ridin any horse. 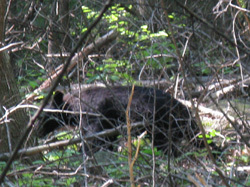 Soon we saw a little black bear walking in the woods and said hi. He didn't say hi back. We watched the bear then he left. 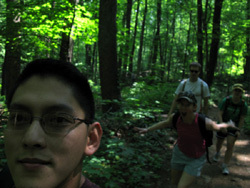 Then we started to hike agin. As we got high up on the mountin, there were lots more hikers and not just us. We saw a boy scout troop that was to fat to go up the narrow part so there was a line for a long time til they got all the backpacks and the fat scout leaders through. Then we saw another bear on the path and all the scouts were afraid that it would attack them but I knew I could cast Hibernate Rank 1 on it and we could get away so I wasn't scared. Then we saw a dog who lived on the mountin all alone but he was sleeping. then we walked over some rocks and saw some more rocks. There were rocks all over. Finally we got to the top of the mountin (the summit) and sat down for lunch. I had a turky sandwitch with mayo and some water. We ate and my feet hurt. the view was pretty to. 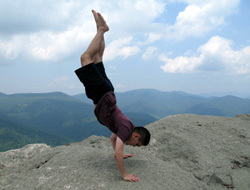 Before we left, I did a handstand becus it is cool. Then we left. We went a diffrent way home becus there were to many hikers comin up the good way. The way home was smoother and had not as many rocks, so it was like the coldplay trail insted of the metalica trail. After we hiked some it turned into a road that was very wide but had horse poop on it. It was smelly to. 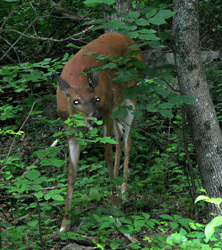 It took us two hourse to reach the bottom and we saw a deer on the way that wasn't scared at all. it wsa starring at me and only a few feet away. we got back to the car aroun 3:00 o-clock and drove home getting some cheep gas on the way. Then we showered and went to red robin with becca to celebrat Rebecca's birthday. then we came home and played mario kart with Mike but we lost and watched a movie til we fel alseep.